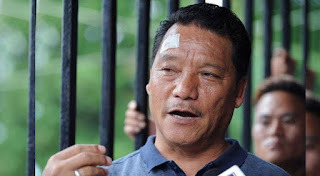 The GJM with combined support of hill parties, spearheading the agitation for a separate Gorkhaland, adopted a confrontationist stand today with its chief Bimal Gurung threatening to intensify the stir and demanding a CBI inquiry into the alleged police firing in the hills on June 17. The Gorkha Janmukti Morcha (GJM) leader, who was not seen in public for the past several days, appeared before the media at Patlebas in Darjeeling, a party stronghold. “I am not Kishenji (Maoist leader) who can be eliminated in a police encounter. I have not taken up arms against the country. I am fighting for the identity of the Gorkhas and in a democracy I have every right to do that,” he said. “Our fight will continue and I will fight till the end,” he said. He said the GTA was a “closed chapter” and that the next all-party meeting will be held on June 29 to decide the next course of action.